Richard Kadrey made a name for himself in the late 80's and early 90's as a pioneer in Cyberpunk with books like Metrophage and Kamikaze L'Amour. With the Sandman Slim series he has brought an edge to Urban Fantasy seldom seen which is why it made my best of 2009 list. Coming later this October we'll be treated to some more of Kadrey's Stark no pulled punches style with Kill the Dead. This is a man not afraid to stab an Angel in the back. The cover is perfect for the series. It is stark and desolate yet colorful like Kadrey's prose. I especially like the clashing of the green sky with the orange type. 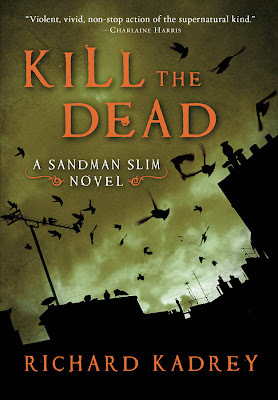 Sandman Slim just came out in mass market for those who didn't take the hardcover plunge. Also, the hardcover is on sale at Amazon for $9, which is a steal and a great little package. Sandman Slim was a shockingly great read... I read Metrophage 20 years ago and thought it was good, but I think Kadrey has really found his muse with this hardboiled multi-genre thing... really good stuff and very much looking forward to the sequel. I like it, also. The colours are perfect. I like the cover a lot. I picked up Sandman Slim in paperback but I have not had a chance to read it yet. Guy Jean Genevier Creative Photography. I am the author of the photograph's cover. I made this image in Paris - France ten years ago. A view,from my window flat in the 9th section of Paris, on the old roofs of the city at the end of the day. The shooting was digital and I worked the image on computer, I obtained a monochrome orange for the sky, the rest of the image being against day, thus dark. The publisher changed the tone of the image in darker towards the green, what gives an interesting depiction in agreement with the narrative.